The atmosphere for an Opening Day game is normally light-hearted and festive, but tonight's mood was more intense. Maybe it seemed that way because I hadn't sat in the bleachers for the opener before, or because this was a Saturday night game instead of a weekday afternoon, or because a lot of people who had originally come for the afternoon game that didn't happen had spent all day in the local bars. After all the anticipation of the past two days, we couldn't wait for something to finally happen. Pedro Martinez did make the start, but with a day off Monday and the rainout Friday, it had been a full week since his last start. He had probably started his pre-game preparation before both rainouts, too, and he was a bit rusty in the first, allowing three runs. There was a lot in the press after this game about how Pedro was booed by the Opening Day crowd, and the behavior of some fans behind the dugout was cited as one of the reasons he didn't talk to the media for the rest of the season, but I was surprised when I heard all the fallout later. Out in the bleachers, the mood was positive. The people in my section just figured he was rusty from having extra time off. Pedro struck out the side in the second inning, and retired the Orioles in order in the third and fourth. A guy in the row in front of me said, "See, he always gets better as the game goes along." 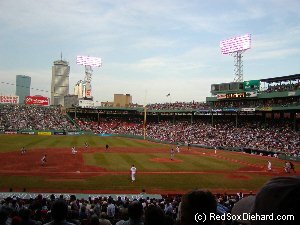 Johnny Damon hit a homer in the third inning to pull the Sox to within one run, at 3-2. So it came as a great surprise when Pedro allowed seven runs in the fifth inning. When he left the game, everyone in my section gave him a standing ovation in appreciation of all the The Best Pitcher on the Planet has done for us, and I don't remember hearing any boos. I was surprised later to hear that there was a negative reaction by a few fans which became the focus of the media. Earlier in the game we were given a couple of scares. At the start of the bottom of the fourth, the Orioles had already taken the field, but suddenly all the players were called off the field. At the same time, a group of security and police ran up the steps of my section to the back row of the bleachers. After a few tense minutes while we wondered what was going on, we found out that the events were unrelated. The home plate umpire had been hit in the face mask in the previous inning, and the game was delayed while he decided whether to return. Security was just responding to the typical bleacher fight, but it was the timing of the two events that made us nervous. The umpires all shifted over, and the game actually went a few innings with no second base umpire until a replacement could be ready. Then at the end of the fifth inning, the grounds crew came out to rake down the basepaths, but Sox third base coach Mike Cubbage had not left the field yet. Next thing we knew, a bunch of players were rushing out of the Orioles dugout. I thought there was some kind of argument or brawl going on, but we found out later Cubbage had had a diabetic seizure. Bench coach Jerry Narron served as the third base coach for the rest of the game. Jeremy Giambi and Kevin Millar had RBI's in the late innings, and Todd Walker hit a two-run homer in the ninth, but it wasn't enough. A wild and much anticipated game had ended in disappointment. After a win against Baltimore on Sunday, the Sox had Monday off. My next game was Tuesday night. I had a seat pretty far back in Section 39 in the bleachers, which I had gotten as part of a Value Pack of four tickets. My friend had a pair of seats in Section 26 behind third base, and the person who had planned to go with her couldn't make it, so she said I could sit in the good seats with her. The weather was pleasant that night, one of only a few games I went to in April and May that weren't freezing. Casey Fossum started, and he pitched really well, allowing only one run in seven innings of work. Meanwhile Manny Ramirez had knocked in a run in the first, Johnny Damon hit a solo homer in the third, and Jeremy Giambi had an RBI double in the fourth. When the Sox tacked on two more runs in the fifth, it looked like they would cruise to an easy win. I was glad to think Fossum would get a win, because he had pitched so poorly in Spring Training after being the subject of trade talks all winter. It was rumored that he would be traded for Bartolo Colon, but the Sox hung onto him and were depending on him to be the fifth starter this year. After Fossum had finished seven solid innings, the Sox were ahead 5-1. Ramiro Mendoza was summoned for the eighth. He promptly gave up four straight singles and a wild pitch which made it 5-3, with no outs and the tying runs on base. Mike Timlin was next, and he gave up a game-tying single before getting out of the inning. So much for Fossum picking up the win! Timlin got through the ninth with the score still 5-5, and the game moved to the bottom of the ninth. 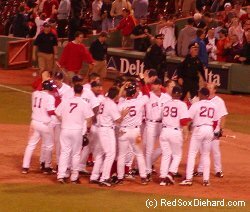 In all the games I've been to at Fenway Park, I had never seen a "walkoff" win, where the Red Sox had won in the bottom of the ninth or in extra innings. There were plenty of them each year, but I always seemed to go the day before or the day after these memorable wins. Yet I always hold out hope, thinking that maybe this game will be the one. Bill Mueller started the bottom of the ninth with a walk, and Nomar Garciaparra singled. After Manny flied out to center, Todd Walker came in to pinch hit for Damian Jackson, who had been brought in a few innings earlier when the Sox had the lead. Walker walked to load the bases. Shea Hillenbrand was up next. He had already had three hits that night and was on one of his usual early-season tears. The Devil Rays went to the bullpen, so we had plenty of time to cheer in anticipation of a game-winning hit. "Just not a double play," I thought. Hillenbrand swung and missed for strike one. "Hack-Away Shea," I muttered and rolled my eyes, laughing but all the while still believing that he would end the game on a happy note. I vowed right then and there that if he got a hit and won the game, I'd never again call him "Hack-Away Shea". Sure enough, the next pitch dropped in for a hit, and the game was over! Shea's teammates mobbed him at first base, and we all jumped up and down in the stands. It was my first walkoff win, and it wouldn't be my last. 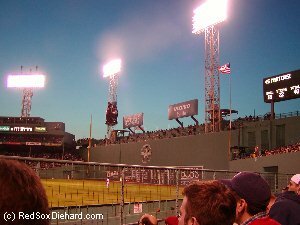 After the dramatic Tuesday night win, the Sox went on to complete the sweep of the Devil Rays, and then take the opening game against Toronto on Friday night. I was back again on Saturday afternoon. This time, eveything went according to plan, and there was no need for late-inning heroics. The Sox scored five runs in the third, capped off by Trot Nixon's triple. 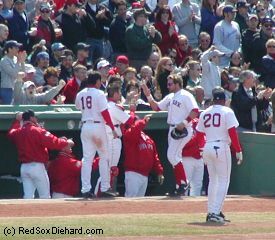 When Manny Ramirez was hit by a pitch in the fourth, he took a couple of steps toward the mound, prompting both benches and bullpens to empty. Nothing came of it, as players from both teams just stood around, but Manny was cheered by the left field crowd when he took his place the next inning. A three-base error by Carlos Delgado helped the Sox score two more runs in the fifth. Derek Lowe went five innings, giving up only two unearned runs. Jason Shiell made his Red Sox debut and pitched three scoreless innings. Brandon Lyon had a 1-2-3 ninth, and the Sox had won their sixth game in a row.